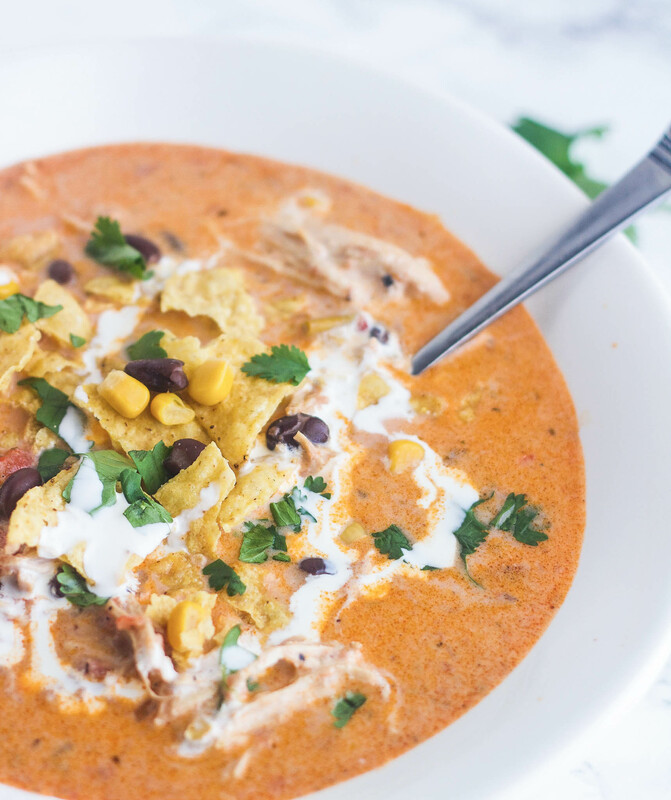 This Loaded Chicken Nacho Soup is cheesy, comforting and so delicious. Fire-roasted tomatoes add a bit of a smokiness that makes this soup even more amazing. It’s like eating nachos in soup form. So I made soup again the other day. That should come as no surprise because you all know what a whimp I am in the winter. I’m freezing all the time and all I ever want is soup. Thankfully my boys love soup too and never seem to mind that I make it all. the. time. 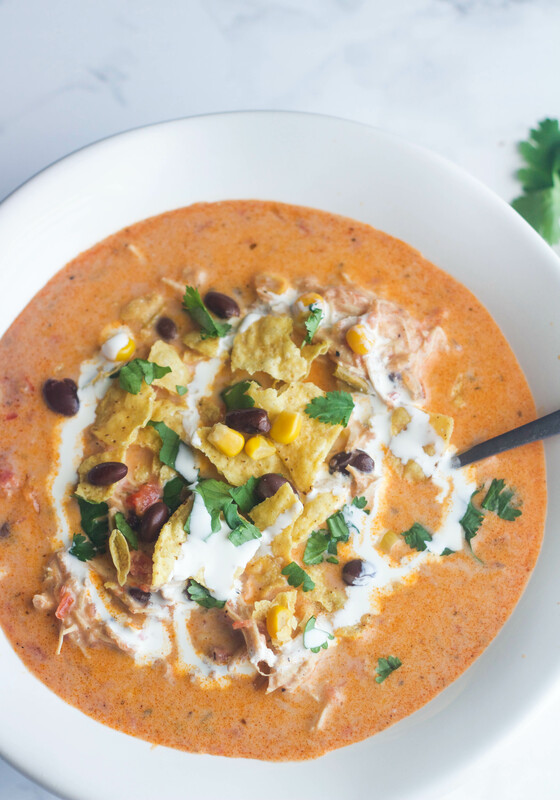 This Loaded Chicken Nacho Soup is a must make. It comes together in no time at all, it’s crazy delicious and is definitely an easy, no-fuss meal. You can use a rotisserie chicken or cook and shred your own chicken breasts. I’ve done it both ways and either way is a win-win. Garnish this with any toppings of your choice. . . cilantro, crushed tortilla chips, sour cream (A MUST! ), avocado, salsa, etc. The options are endless. You can even drizzle it with a little extra cream and stir in. . . .YUM!! If you’re feeling a little frigid all the time like me and want to warm up, then you should make this soup. It will totally hit the spot and warm you up right down to your little toes. I think maybe I need to give our dog Buddy some of this soup. He got groomed last week and he can’t seem to get warm either. You can literally hear his teeth chattering and he is shivering all the time. We keep a space heater on in our family room and he lays by it most of the day. I’m sure it doesn’t help that he’s 16 years old and his body is so frail. I’m thinking I should have just let him look like an orphan dog and kept his fur long . . . .poor Buddy. Let me know if you give this soup a try. In a large pot over medium heat add oil and onion. Cook until tender and golden, 6 minutes. Add garlic, cumin, chili powder and cayenne. Stir until fragrant, 1 minute. Add fire-roasted tomatoes, corn, black beans, and chicken and stir until combined. Add chicken broth and bring to a simmer and let simmer 15 minutes, then stir in heavy cream and cheeses until melty. Garnish with sour cream, tortilla chips, cilantro, or any desired toppings.